Watch people take note when you roll in wearing this blue sequin dinner jacket. It's pure Vegas baby. If you perform on stage for a living or just like to wear bold looking dinner jackets and blazers that you see entertainers wear on stage. Vinci makes the blazers for you. 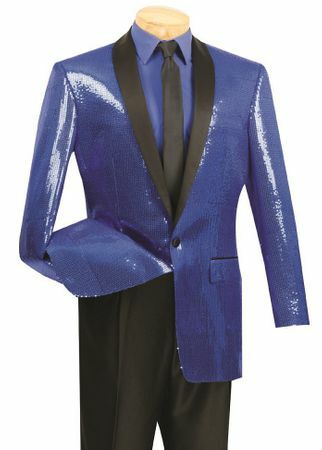 This blue sequin dinner jacket features a single breasted style and is designed in Italy with pure Italian style. Made of fine poly microfiber fabric. You will perform like the star you know you are wearing this blue sequin dinner jacket from Contempo.